Remember when I said we got rid of the non recycling bin for 2018? That would not have been possible without subscribing to the eco brick idea. So what’s so special about the eco brick? Eco bricks keep plastic and carbon dioxide out of the biosphere. Plastic pollution is suffocating our planet and we are learning the hard way that being a throw away society doesn’t do the environment any favours. By packing your own ecobrick, you are taking responsibility of the plastic that you use. Plastics are made from petro-chemicals. These chemicals don’t fit back into the ecologies around us. 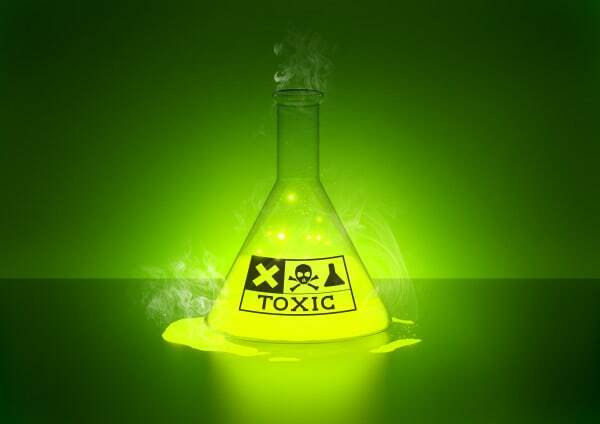 Scientific studies show that the component chemicals are toxic. Plastics that are littered, burned or dumped will eventually degrade into poisonous chemicals over time and will leach into the land, water and air. It is then absorbed by plants and animals. Engineered dump sites may seem like a solution but after reading an article written by someone who worked at a large plastic recycling facility, I’ve realised that they are merely a temporary solution which uses a lot of resources and energy. All the chemicals from plastic will seep into the biosphere in time. Plastics degrade in 3 main ways. They are through heat, UV exposure (sunlight) and friction. Plastics don’t biodegrade, they photodegrade. 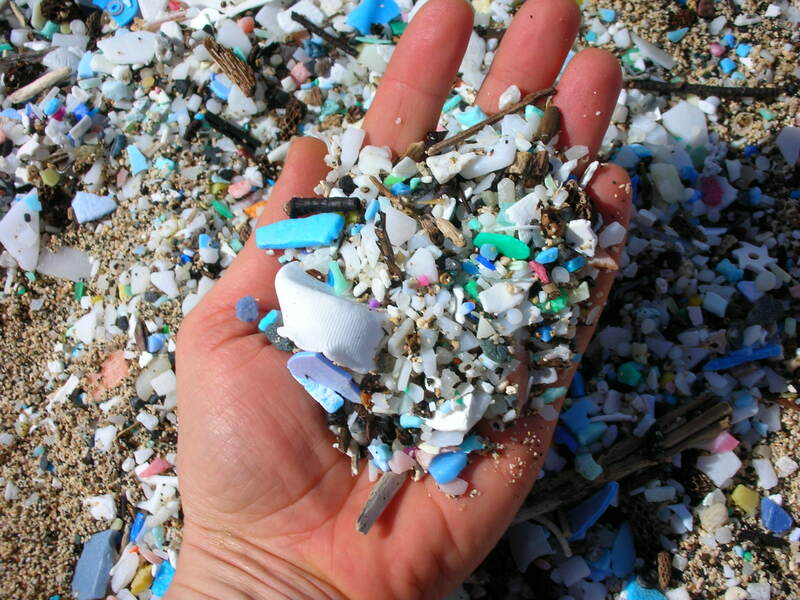 This means that plastics left for years in fields, beaches or water will slowly break into smaller and smaller pieces. Eventually these pieces are so small that they are absorbed by the plants, fishes and animals. You could be eating plastic and not even know it. Plastic has dire effects on the human body. Chemicals like Biphenyl A and Phalates are now banned in certain products in America and Europe. 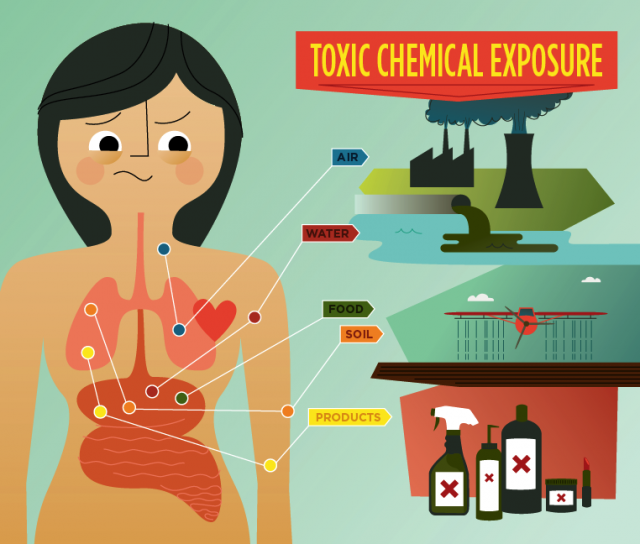 Unfortunately, these chemicals continue to be widely used in the Philippines and other Asian countries. Small amounts of these chemicals have adverse effects on animals including humans and can cause allergies, hormonal imbalances, cancer and acute poisoning. The young are the most vulnerable. Ecobricks trap plastics and prevent them from being degraded by sun, heat or friction. Yippee for eco bricks! !The sad truth is that many people don’t realize just how dangerous and toxic plastic can be. Perhaps most significantly, the hands on process of making an ecobrick raises the maker’s ecological consciousness. The process is meditative. It gets Ecobrickers reflecting: Where did this plastic come from? Where is it going? Why is it here? Where will it be in 100 years? Would it be better to just grow my own coffee? To reuse the material of a simple plastic bottle, the global industrial recycling system uses a vast amount of energy. 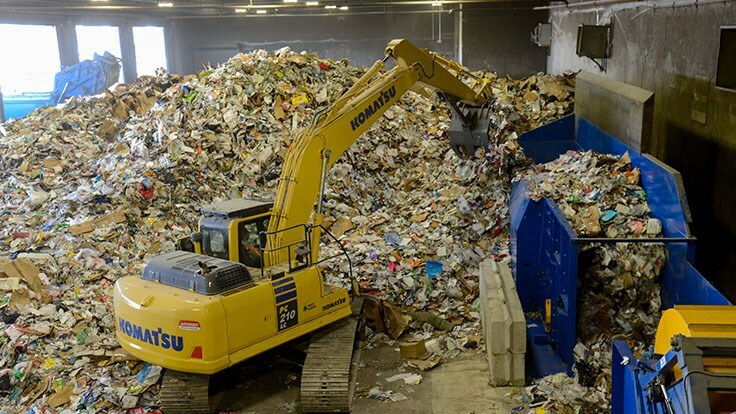 Plastic is first collected by trucks and delivered to a sorting facility involving massive machinery. The plastic is then shipped across the world to a foundry to be turned into raw materials. These raw materials are then sent to a factory to produce a new product. This product is then shipped around the world to a store.To make matters even worse, plastic that has been recycled will never make the same quality of plastic again. E.g A PET bottle when recycled will not make another PET bottle. Instead, the recycled plastic will be of a lesser quality and used to make something else and each time it is recycled, it will produce a lesser quality to eventually end up on a dump or hopefully, in an eco brick. 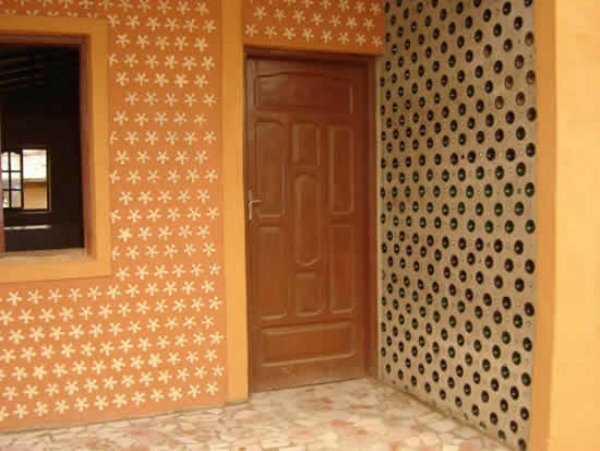 Ecobricking and the application of an ecobrick takes place within the circle of one’s community. The consumed plastic is put to use locally. There are no machines, transportation or high energy systems required. Traditional waste management systems require giant budgets, proprietary technology and vast amounts of energy to run. The recycling of plastic bottles can result in plastic bouncing around the planet from a store in Canada, to a foundry in China, to a factory in the Philippines, to a river, to the ocean. Often, as soon as a city builds a recycling plant, there is already more plastic than capacity. Ecobricking requires no special machines, skills, or finances to implement. The technology is 100% open source. Because of its simplicity, Ecobricking can spread and over-reach plastic consumption rates. Ok! I get it so how do we make them? Ecobrick making is simple, but there are important guidelines. Start right as this is a long-term lifestyle habit that you, your household and community are starting. If you’re working at a school, it is important that your ecobricking sets the example for your students. Make sure that students are guided and graded strictly for their first Ecobricks. Your first ecobrick is the most important because it will lead to many, many more. Here is a detailed step by step guide to making the best eco bricks that you can make. When choosing the bottle that you will use to Ecobrick your plastic, consider three factors: the bottle’s prevalence, the volume, and the project you will use the ecobrick for. Prevalence: Be sure to choose bottles that are in abundance in your community. Its ideal to have everyone in your community ecobricking with the exact same brand and bottle, so you’ll want to make sure there is a good supply. Volume: Large 2L bottles will take a lot of plastic…. but also take a long time to make. We have been busy with our first 2L bottle for over 2 weeks already and it is only half full! For workshops, small 500ml bottles are best. New ecobrickers can finish one ecobrick easily. Large bottles are best for advanced ecobrickers. Project: For building modules with Ecobricks, you need bottles that are exactly the same size and shape. For outdoor building projects, exact sameness is not so important, so long as the volume is consistent (i.e. all 500ml bottles). Depending on the size of construction, you will need different size bottles. E.g. small bottles make good walls, and large bottles make good benches. All you need to Ecobrick is a stick. Having the right stick will make a big difference though. Bamboo and wood make the best sticks. 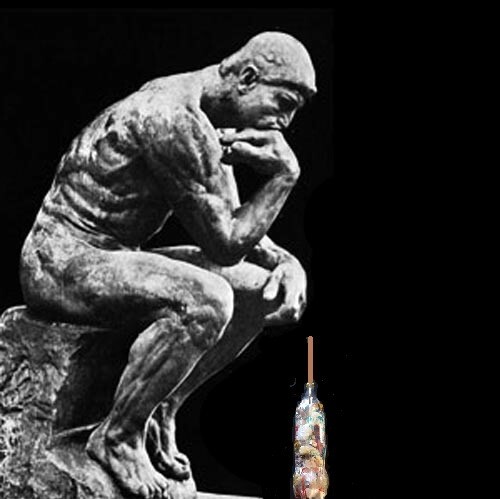 The size of the stick depends on the type of bottle you go with. The best stick is one that is roughly one third the width of a bottle opening and about twice the height of your bottle. Avoid sharp cornered sticks as they can rupture the bottle and you can get splinters and blisters on your hand. Metal, paper, cardboard, glass and biodegradables will not poison the biosphere, so there is no need to put them in a bottle. Thank goodness for that! Use the space of your ecobrick to pack away the otherwise dangerous plastics. Be especially careful not to pack sharp metal or glass into an ecobrick. As you pack it down it, will rupture the sides and pose a danger for handling. Use a coloured soft plastic to give the brick bottom a color. Pack it in with your stick to fill the first one or two centimeters (you might want to use a few plastics of the same color). Cellophane works great. By giving your ecobrick a bottom colour, you open up colorful design possibilities. 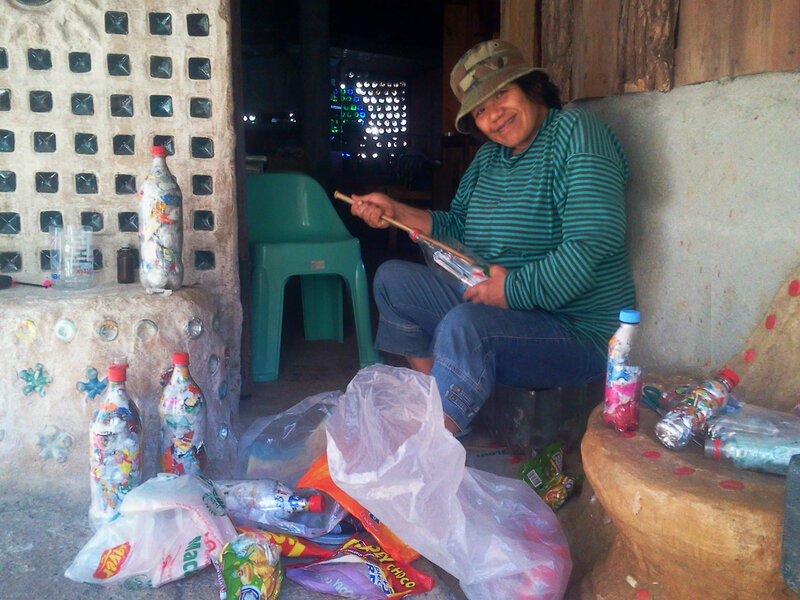 Often companies, organizations or schools will ask their members to make Ecobricks with their community colors. Save and segregate your non-biodegradable waste. Ecobricks are best made with clean and dry plastic. After all, you may be using the Ecobricks to build furniture for your home and you will want it to look good. Dirty plastic will lead to microbiological growth and the formation of methane inside the bottle (for a solution for dirty plastic see the Ocean Ecobrick). This can lead to bloated Ecobricks and in rare cases, caps popping off. As our eco brick sits in the kitchen, we pack ours as we need to throw away so the rubbish doesn’t build up but goes straight into the Ecobrick. Use the stick to push the plastic around the inside of the bottle down. Move in a circle pushing down along the sides. To maximize the density, its good to mix soft, then hard plastic. Cut up big plastics into smaller pieces. The smaller the pieces, the denser you’ll get! Special Tip: Once you get to the middle of your ecobrick, pack 2-3cms of lighter colored plastic. By forming a center ring made of white plastic, you will later have a clear location to label your Ecobrick with a permanent black marker. Keep packing your ecobrick until it is full. A 600ml bottle will have a minimum weight of 200 grams and a 2000ml bottle will have a minimum weight of 700 grams. Minimum density goals are a good way to motivate Ecobrickers and ensure quality Ecobricks. Ecobricks that are too soft cannot be used for modules. 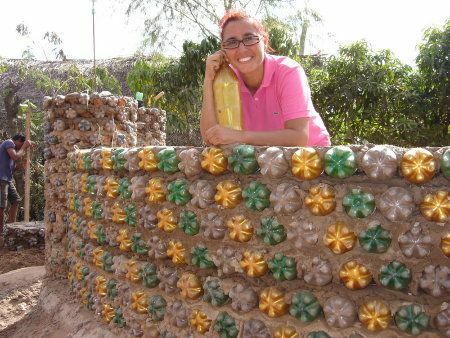 Ecobricks that are too squishy can compromise horizontal cob construction. By densely packing the bottle, we maximize the volume of the bottle for trapping and keeping plastic out of the biosphere. A good solid ecobrick is something you can be proud of. You may use a log sheet or the GoBrik app to log each ecobrick as it comes in. There you can also find a log sheet that can be photocopied. Record data such as the maker of the ecobrick, the weight, the bottle volume, the quality, etc. This way you can track your community’s ecobricking progress. Paper and spreadsheets work great– and so does GoBrik, the free web based app that designers worked hard to develop. just for this purpose. 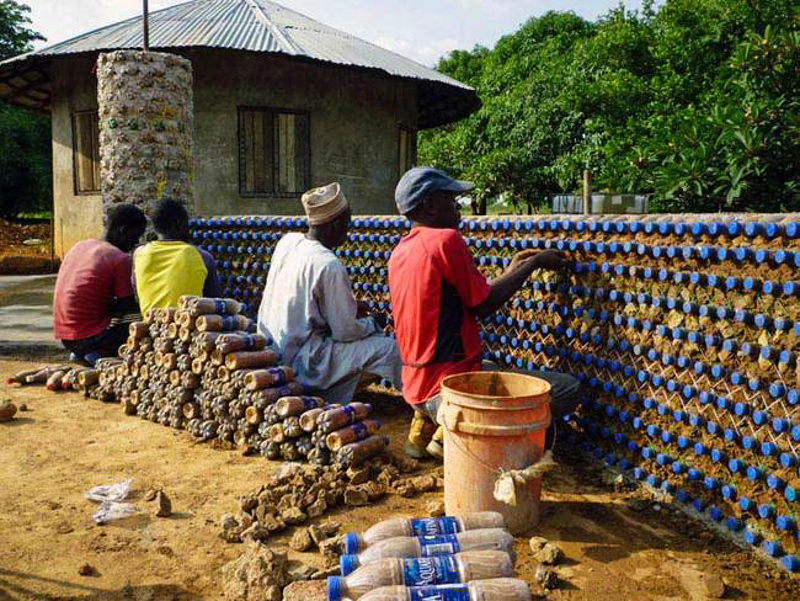 Many ecobrickers write a prayer or a vision on the bottle in a permanent marker. Your ecobrick will last a long time. Why not let your grandkids know that you were thinking of them? Once complete, you will need to store your Ecobricks until you have enough for your project or you can drop them off at a drop off point where the bottles will be collected to build. Store Ecobricks indoors, out of the sun. Stack horizontally, with the bottoms pointed outward (this way you can see the colors you have to work with). Its good to have the Ecobricks raised slightly above the floor as rats have been known to chew away at bottles! Once you have enough Ecobricks you’re ready to build. 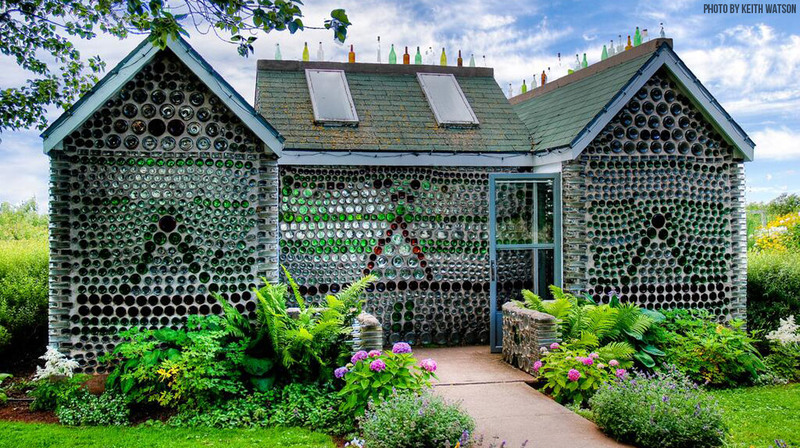 There are five main techniques for building with bottles and Ecobricks. The easiest, fastest, and perhaps the most fun Ecobrick application, is to make Milstein modules for horizontal building and Dieleman modules for vertical building. With modules you can create benches, table, chairs, structures and more. 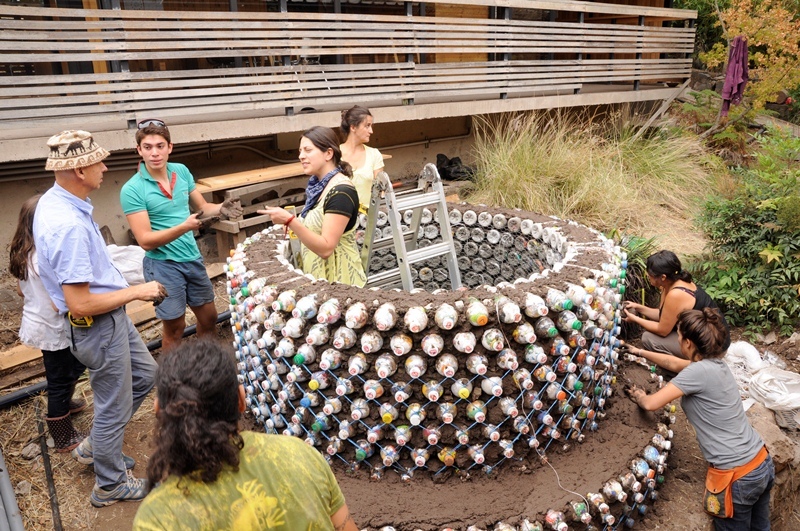 Some say, the best use for Ecobricks is building community green spaces. 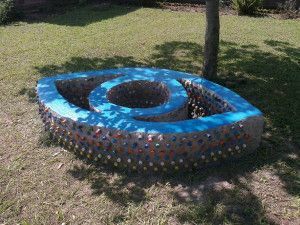 Using local earth and Ecobricks, you and your community can build beautiful spaces that enrich the local environment. Note: A different process is used to take Contaminated plastics from the ocean and make an ocean brick. More information about that process here. Excellent article, I need to truly improve the content I have.